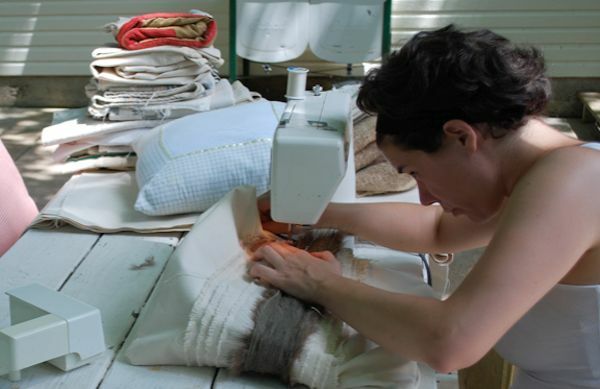 “Even the most modest of projects can become something beautiful. There is no such thing as too far gone. Boy do those words ring true in today’s Wandawega post. It’s about the latest addition to David and Tereasa’s magical campsite: a modern, pitched roof treehouse- designed and built by a wonderful bunch of friends. 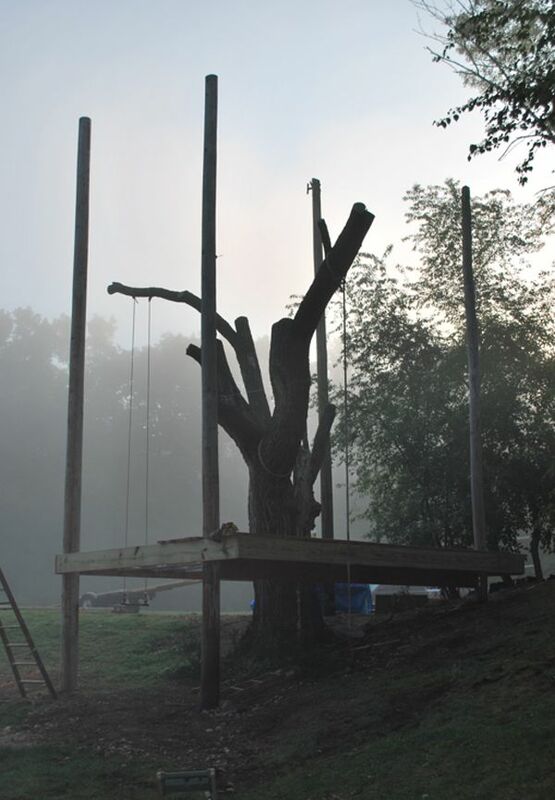 The project all started with a big, old elm tree located right in the center of camp. Shortly after David and Tereasa purchased Wandawega, Tereasa’s Dad, (Tom) christened the property by hanging a rope swing from one of its branches. Sadly, Tom passed away a year and a half later, and around that same time, the elm tree contracted Dutch Elm disease. Tereasa said she “could not cut it down”. Further investigation into the elm’s condition revealed that even though its branches were dying, its trunk was still very strong. So instead of chopping it down, David and Tereasa’s friends teamed up to work on the once-in-a-lifetime dream project for them. 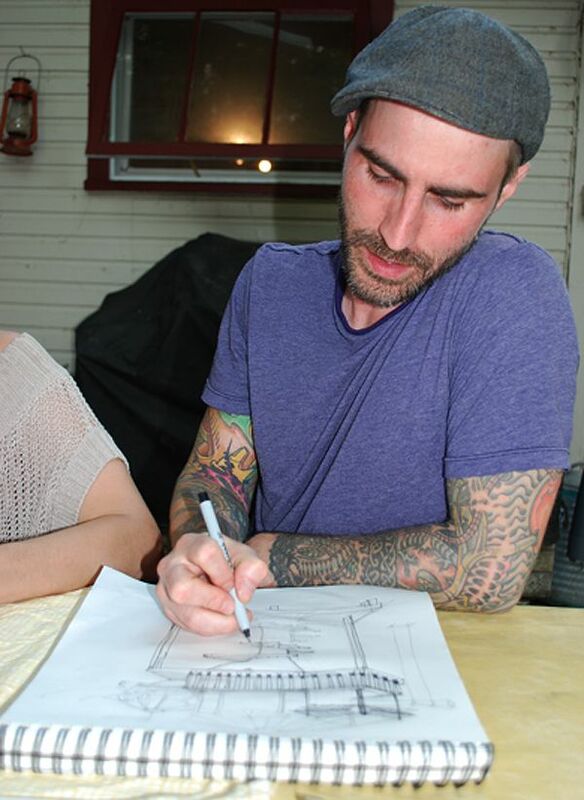 Tereasa and David’s carpenter/furniture-maker friends started by sketching out plans. 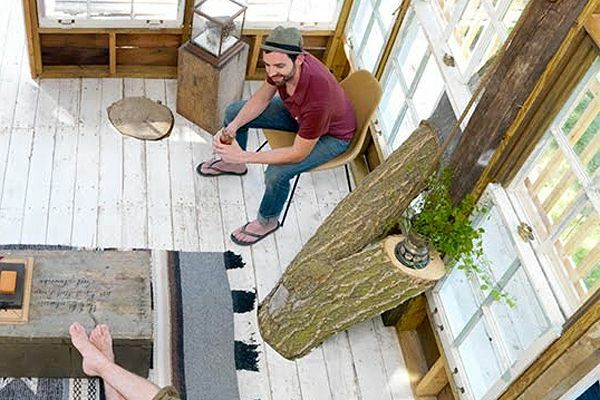 Ultimately the group settled on a three-level cottage in which the tree comes through a deck near ground level, then breaks through the floor in three spots on the first level of the house. 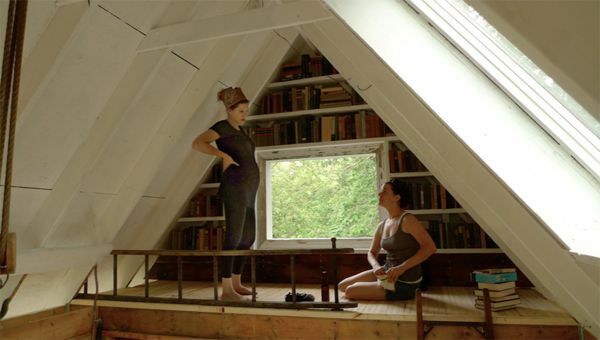 …which can both be reached by sturdy wooden ladders. The materials they used aren’t just run-of-the-mill two-by-fours, either. 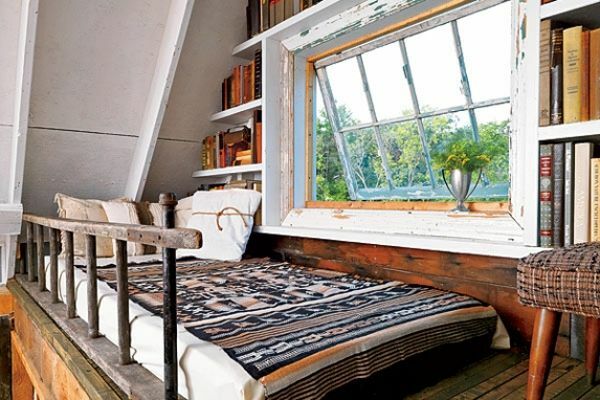 The windows are vintage, and most of the wood is reclaimed. 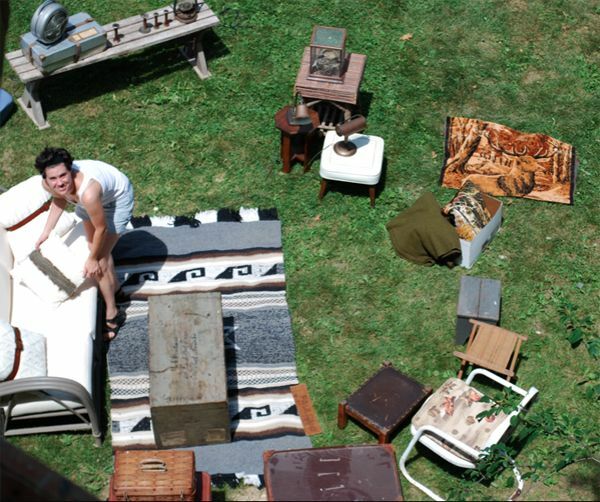 Some from a dilapidated dairy barn near the property, the rest from a demolished Chicago bungalow, sourced from the ReBuilding Exchange. 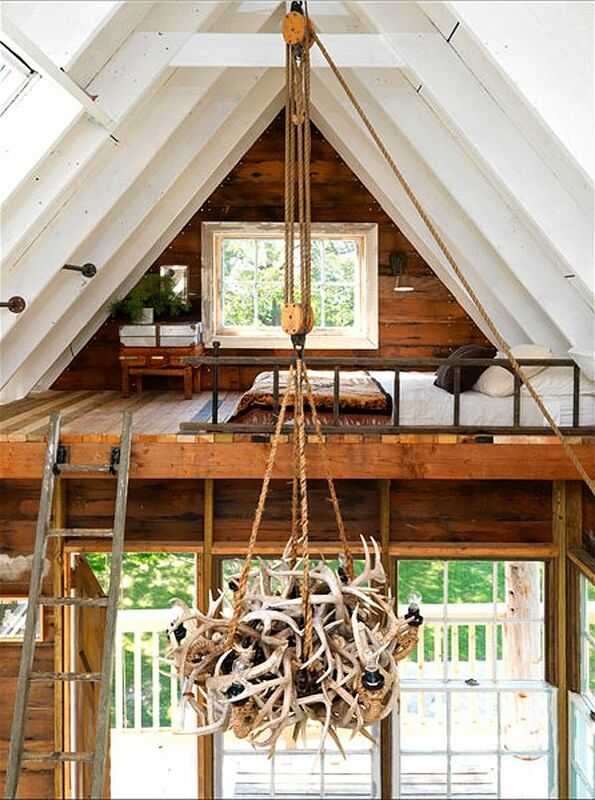 Once the treehouse structure was built (It took about a years worth of sometimes 15-hour long weekend days to complete it), Tereasa and her friend, Angela, went to work on the interior- furnishing it minimalistically, but cozily, with found and vintage pieces. 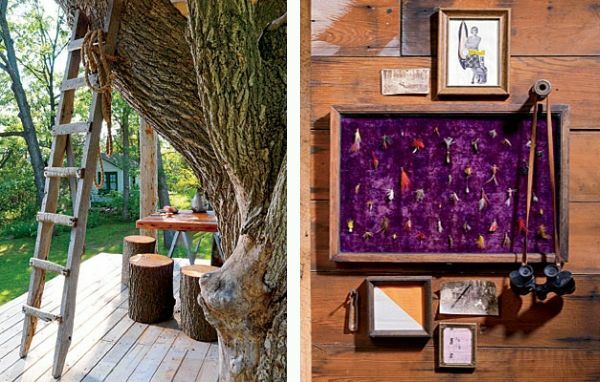 …to the stumps coming through the floor boards, that now act as side tables. But the ingenuity doesn’t stop there. Outside, and down below the main floor, David created pendant lights from old mason jars Tereasa found in the basement of one of the buildings on the property. 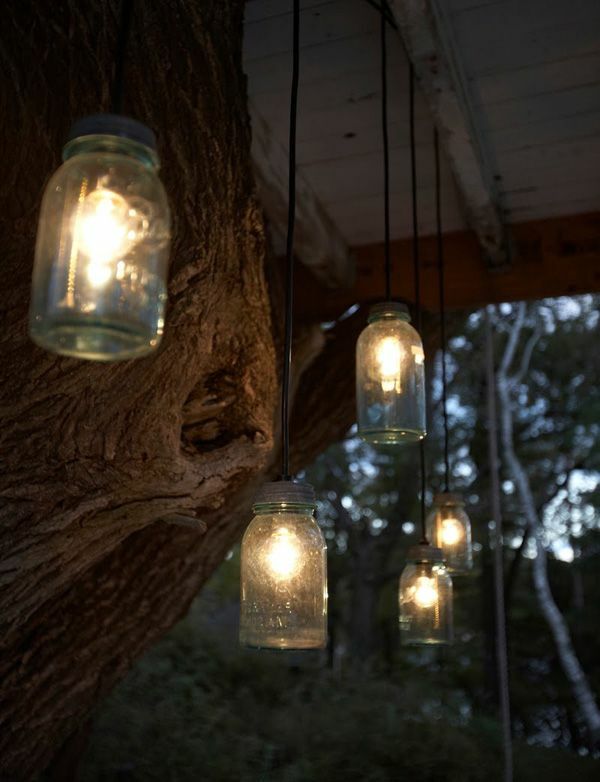 He used some edison bulbs Tereasa picked up at Home Depot, along with some simple lamp kits (adapted with extension cords) to create them…. I hope you enjoyed the tale of the Wandawega treehouse today. Stay tuned for more Wandawega Week posts to come- and if you missed days 1 and 2, you can find them here: Camp Cottage and A Very Modest Cottage Giveaway. You can find days three and four here: Camp Tent and Camp Wedding and Baby. My five year old and I want one! 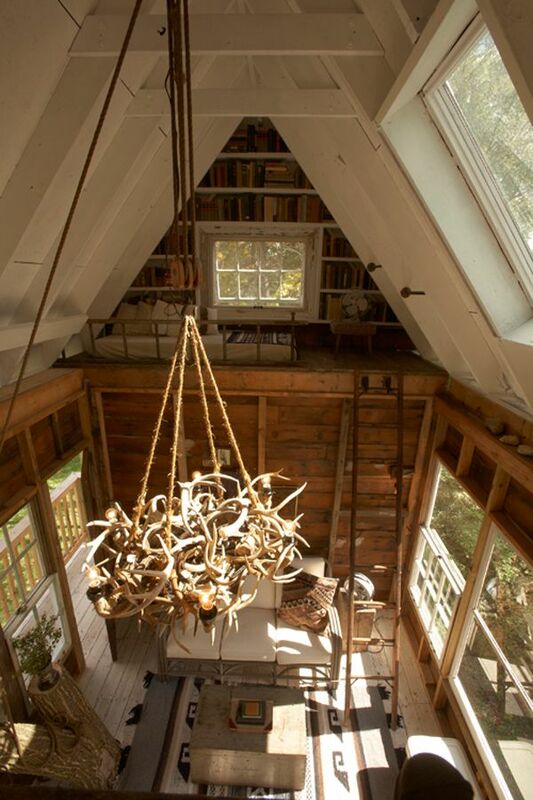 Beautiful story and love the chandelier. 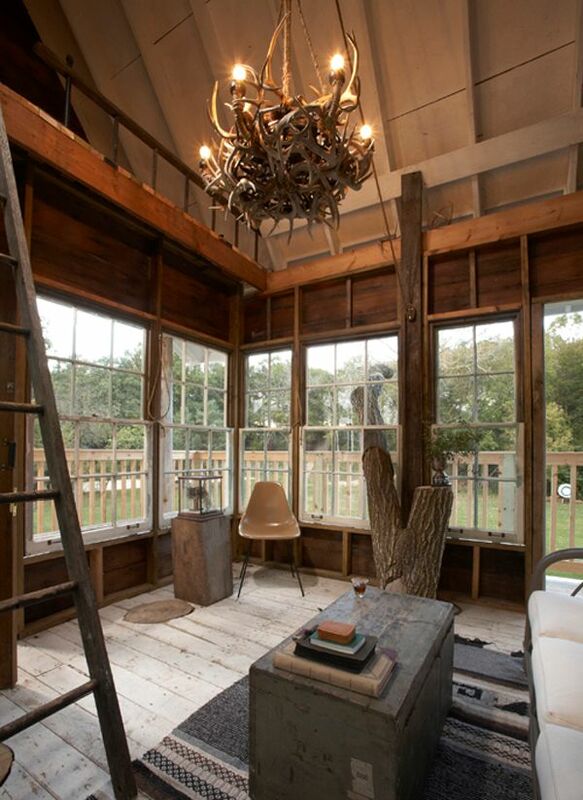 This post just warms my heart… The most amazing treehouse I have ever seen. I have no words — this is utterly amazing. One of the most beautiful, heartwarming things I’ve ever seen. This is absolutely awesome! I remember when I was a child, and all the kids from the neighborhood pitching in and building a treehouse in the woods near our homes. The whole article was nostalgic and wonderful for me, I can only imagine how much fun it is for anyone who is fortunate enough to enter. It’s gotta be a kids DREAM!… and honestly mine as well. This is spectacular, unbelievable and perfect. 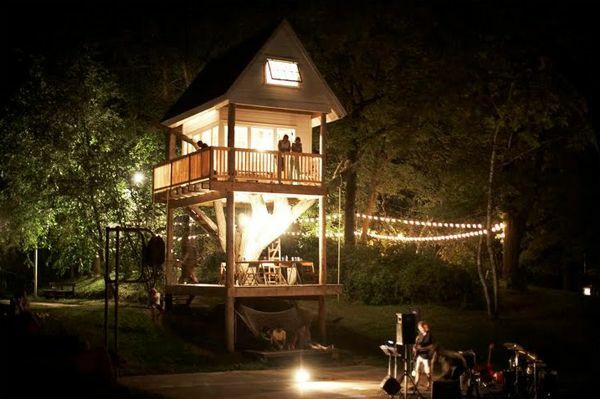 What a great tree house and story behind it. What a lovely sentiment. you know what would be awesome, is if that elm tree started sprouting new leaves from all the love! Okay just on the limbs that are outside, not inside! lol! I do not use the word very often, but this is totally awesome!! WOW. There are really no words to express how in LOVE I am with this! If i were catholic, i would have to go to confession for all of the envy i am feeling. 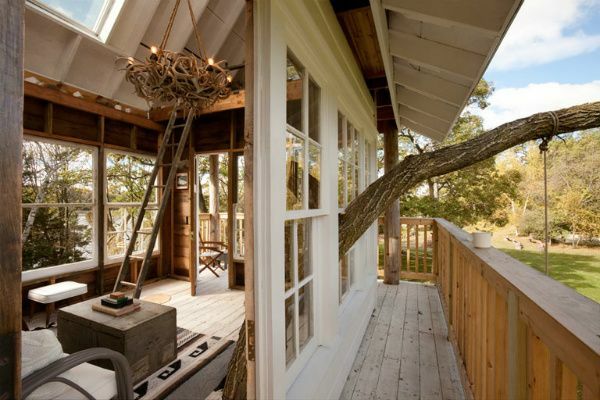 I am very curious about the green trunk being used as a coffee table in the treehouse. I have an almost identical one in my basement. It’s the trunk that my Latvian grandparents used for their belongings when the emigrated to the U.S. How can I find out about the treehouse trunk? We need 2 of them! One for the kids & one for my home office!! This is the most gorgeous and delightful place I’ve seen in a long time!! I would love to have a house like this! This is just AWESOME!! We recovered a bunch of materials from an old shed and playground equipment that was being torn down and we have wanted to build an AWESOME club house for our kids in our backyard, but have had a hard time finding a vision for what we want to do and how we can pull it all together. 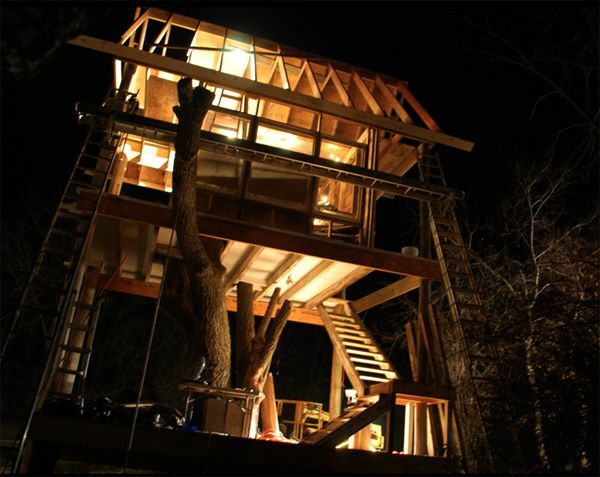 We were thinking it would be cool to build a club house that was patterned after a Fire Lookout tower, but after seeing camp-tree house this is what we want to build, .This post has given us SO much vision and excitement for our new project. 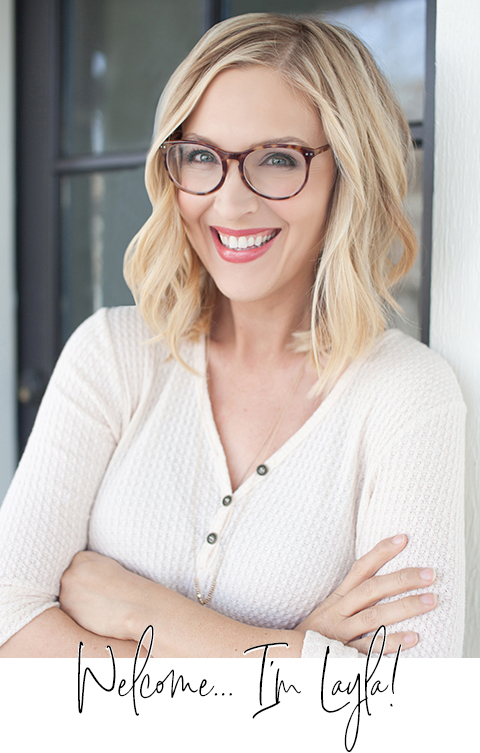 Thanks for having such an AWESOME blog and for sharing such wonderful things with all of us!! We will definitely be back for more inspiration. Have a great day! 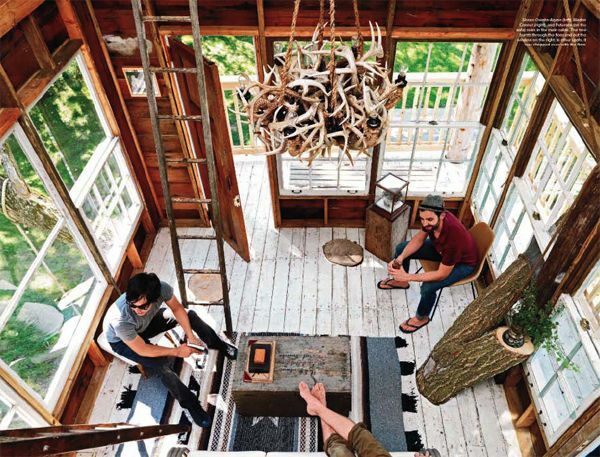 The coolest treehouse I’ve ever seen. This is just so, so, so, so beautiful. Everything about it. LOVE. PLEASE LET ME LIVE HERE! WOW! 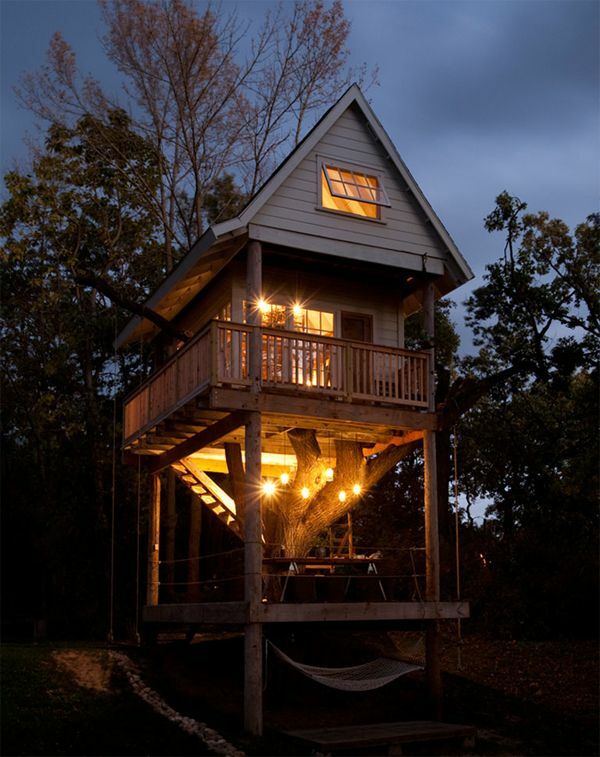 Found your website from Pinterest and this treehouse is AMAZING! 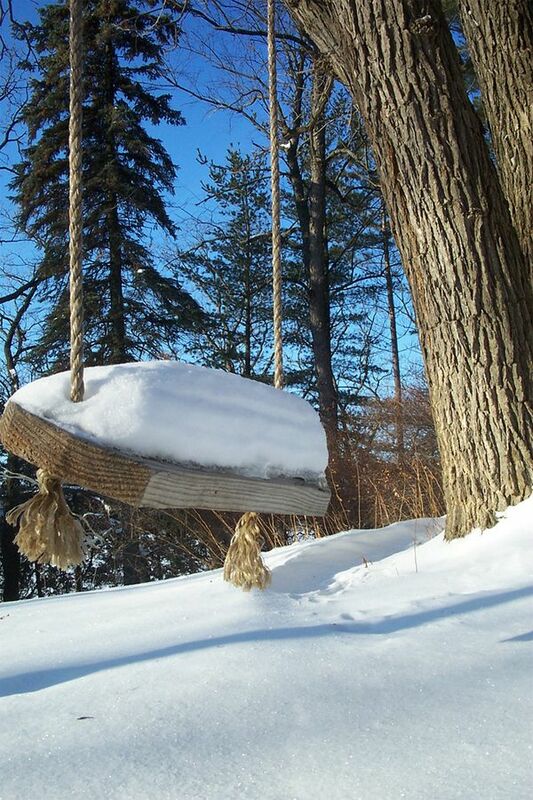 I have to say your swing that was originally hung by Tom brought tears to my eyes and the fact that you named it Tom’s Treehouse. What a wonderful piece of art! Thank you for sharing! I love it. Where is the kitchen? Where is the bathroom? That is so awesome! Love the story behind the “tree house” It reminds me of the story “the giving tree”. 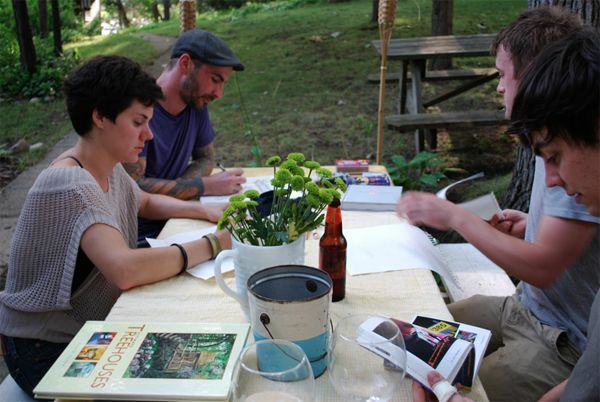 May you have many happy times enjoying the cottage. 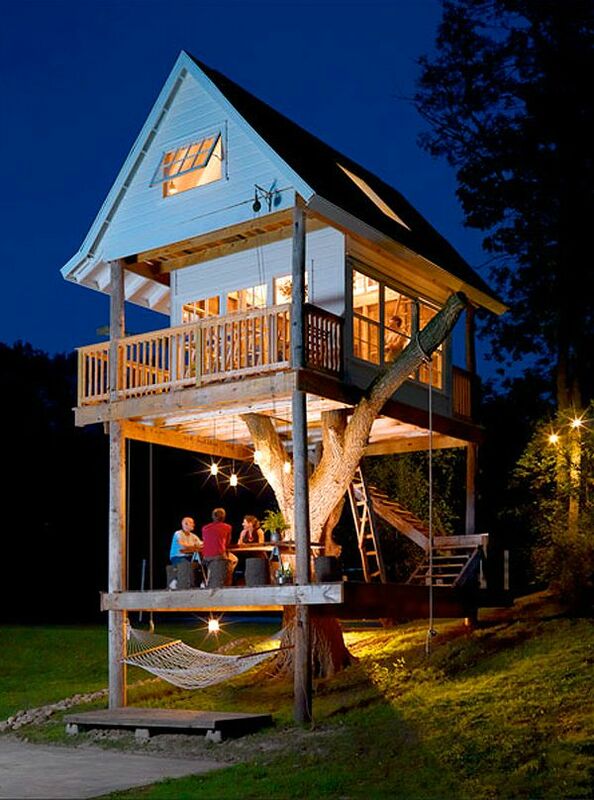 What an amazing tree house! It is truly beautiful and I wish I could pack myself a suitcase, hop on a plane and come and see it in real life! Great work and a lovely story too. WOW, after using a jack to lift my jaw off the floor all I could think was wow this is so amazing. The only thing you need now is a nothing! It is spectacular through and through. I must admit my favorite thing is the branch through the window. It looks so unique and its such a great idea to use the tree instead of getting rid of something that is still strong and sturdy. Great article.